A popular name in the blank DVD industry, Verbatim has decided to branch out into the future and come up with its new line of portable USB hard drives using the InSight branding. What really grabbed our attention was that these storage devices are small in size, weighing less than 6 ounces and measuring 6 inches in length. 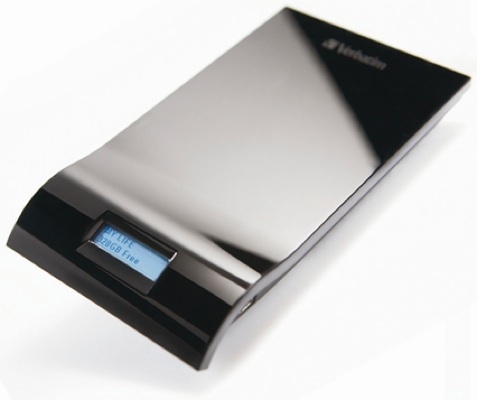 This sleek and durable portable hard drives have sophisticated piano black finish and are available in 320GB and 500GB. Another catchy feature the Verbatim InSight contains is the "Always On" display, which automatically calculates and continuously display the customizable drive name and available free space, even when the drive is disconnected from the computer. How they do it? We are not sure for now. Apart from the USB 2.0 port, this portable hard drive can transfer data for up to 480MB per second. It also has a 5400rpm spindle speed and 8MB cache memory for optimized performance. The Verbatim InSight USB hard drives are compatible with PC and Mac and can connect to either desktop or notebook computers. Backed with a 5-year warranty, they are available through Verbatim retail partners like Best Buy, costing from US$120 to US$150.